A surprising amount of people look nothing like who they really are. The little old lady next to you on the bus might actually be the Queen of Sheba. The handsome, tattooed guy at the cash registry in the supermarket might be a shy and poetic elf. 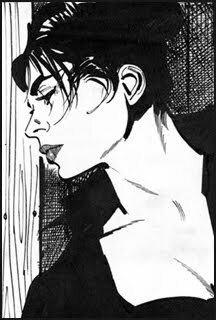 And me: to the unsuspecting eye, I might look like an ordinary middle-aged mom, but on the inside, I’m Modesty Blaise. Modesty never loses her head, no matter what happens. Modesty never gets needlessly anxious. Modesty always knows what to do. She’s sensitive, but always keeps her balance. To those of you who’re now smirking and thinking that that sounds pretty unlike me: you’re not completely wrong. I’m not as cool as Modesty, but that’s okay. Without her I’d be a reed in the wind, a cow on the ice, a rubber duck on the ocean. She’s helped me keep my grip on many occasions, both trivial and some fairly adventurous. ”What would Modesty do?” I’ve thought, and then I’ve let her steer my actions. Modesty herself doesn’t have any children, but she has been an invaluable support for me as a mother. When the kids had accidents I already knew (after having read innumerable Modesty books and comics) how to pre-empt blood poisoning, prevent snakebites and treat gunshot wounds, stubbed toes and splinters in fingers. The man who created Modesty Blaise is called Peter O’Donnell, and it’s his 90th birthday today. Congratulations, Mr. O’Donnell, and a deeply felt thank you for a life with the best internal compass in the world. PS My daughter, who’d hardly read a line or panel of Modesty before our London trip, became thoroughly educated and got two beautiful limited edition T-shirts in the mail a few days later. Unfortunately none of them in mom-size. Här har du ännu ett stort Modesty-fan, troligen ungefär lika otippat. Å, så barnsliga ni är, Anna och Helena! Anna, this is a wonderful tribute to Modesty, and a lovely birthday message for POD! Helena, det ser man ju på en gång att du är en Sån. Lena: jag är ledsen men Tintin har inte en chans mot Modesty. Tur att hon är så snäll! Chrissie: Thank you! I've sent it to Souvenir Press, if they find it suitable maybe they'll pass it on to him. Bravo! Me too! You've done a wonderful job of commemorating a wonderful character and author. Thank you! Another Modesty & Willie fan here, I hope mr ODonnell reads this and feels the love from all of us. Thank you Ann, and Eva: I hope so too. There certainly is a lot of love for POD and Modesty around. One of my best friends named his daughter Amanda Modesty. I think that's so cool! Mycket stolt över att få vara med på / Very proud to be included in the interview section of Modesty Blaise Book Covers! slängde in en länk till din post på vår hyllningspost. Klart du ska vara med där!